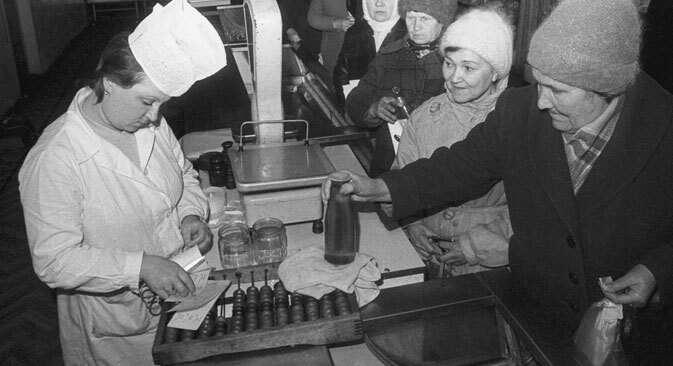 Food items such as sausages, grains and butter were rationed in the USSR/Russia from the mid-1980s for about a decade. Unlike in India today, the Soviet rationing system distributed food to the whole country and not just poor people. Not that long ago, till the mid-1990s to be precise, Russia had a distribution system based on coupons. Originally, the ration coupons were given as part of a motivation system. An outstanding employee would be given a coupon entitling him to receive a TV, a pair of shoes or something else. Without those coupons it was very difficult to buy those items. Later on, a similar system was implemented for food items that were not readily available in the shops. From 1983, the USSR started experiencing a shortage of food supply and food items were rationed for about a decade. Ration cards have been an important part of the Public Distribution System in India, but are now used to support the poor and not to provide food for the nation as a whole. Depending on their financial condition, people can buy food grains, sugar and kerosene with the help of their ration cards. It is considered to be the most important food security network, in terms of coverage and public expenditure. The Soviet/Russian system reached out to a lesser number of people than in India but had to cover the entire country. In 1985, Mikhail Gorbachev launched an anti-alcohol campaign, backing it up with a series of measures to reduce alcohol production and sales. These included limiting the kinds of shops permitted to sell alcohol, closing many vodka distilleries and destroying vineyards in the wine-producing republics. While the anti-alcohol campaign resulted in a decline in alcohol consumption, it also precipitated a sharp rise in the production of moonshine (samogon) - a distilled homemade alcoholic drink. As a result, the demand for sugar increased dramatically and created a deficit of the commodity. People started receiving coupons to buy sugar! I remember at harvest time, there was a big problem to get sugar to make jam from berries. Even with coupons it was not possible to find it in the shops. My mother had to buy sugar several months in advance and stock it to have enough quantity for preservation. These coupons were distributed through the unions and given based on the number of members of a family. Even cigarettes and vodka were given for the kids in the family. The system encouraged barter exchange especially with liquor. Vodka became a valuable commodity and many times was acceptable instead of currency. It is remarkable that our consumption was decided by a third party and we had to adjust and plan for the future: what to keep, what to exchange and how much to eat. I am just fantasising, what was India that faced this policy and not the Soviet Union. What would be the items available only through the coupon system? My guess is rice, ginger-garlic paste, ghee, chilli powder and supari. Thankfully, food and essential commodities are readily available on the shelves of grocery stores and supermarkets in both countries now.